In 2014, Virginia Governor Terry McAuliffe asked Molly Joseph Ward to take the job of Secretary of Natural Resources. No pun intended, but he knew she was a natural for the job. Ward said she was “overjoyed” at the offer and immediately accepted. You might think such a position would be a bureaucratic headache, but that was not the case. She described the job as rewarding and simply wonderful. Molly Joseph Ward was a natural for the job of Virginia Secretary of Natural Resources. How does a lawyer with an undergraduate degree in English fall into a natural resources position? McAuliffe knew what many of us did not. Ward had spent her life outside in Virginia, growing up on the water in Hampton, VA. Her family did not have a television. 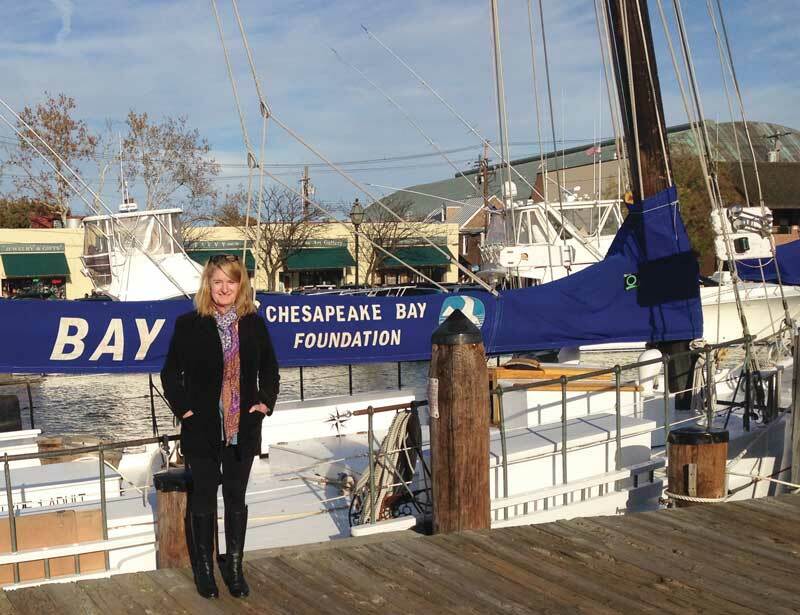 As a result, she was literally outside all day every day, experiencing what the Chesapeake Bay watershed has to offer. There is not a Bay-related pursuit she did not enjoy. Her family crabbed, fished, sailed, ran a powerboat, and paddled a kayak. They dragged their olive drab aluminum boat over the streets and ground so often they wore a hole in the bottom. And it is not just the water. Ward attended camp in the mountains from the age of eight through 18. This was real camping, in a tent. There was no air conditioning. No WiFi. She was outside with the bugs and bears. Virginia’s natural world became part of her. With everyone on the same page, they were able to accomplish a lot. The incredible competence and dedication of her employees made the challenges far less daunting, and made coming to work a delight each day. Ward was amazed at their performance. Together, they had a lot of success. Ward was part of a team that saved and dedicated Fort Monroe, a place filled with history and natural beauty, as a National Monument. In that one spot, you have the arrival of John Smith and the Jamestown settlers, the first enslaved Africans in British North America, and a safe haven for free slaves during the Civil War. Thanks in part to Ward and her crew, the public will have access to the area forever. Another significant success was the creation of Timberneck Farm State Park in Gloucester County. This site is exceptionally important, as it is adjacent to Chief Powhatan’s village of Werowocomoco, the site where Pocahontas allegedly saved the life of John Smith. Timberneck will teach visitors about the real lives of the Algonquin Tribe, and hopefully separate fact from some tall tales and misunderstandings. There will be a boat ramp, cabins, and shelters, as well as the interpretive visitor’s center. The boat ramp will provide ready access to the Captain John Smith Water Trail, in which Ward was also involved. Officially called the Captain John Smith Chesapeake National Historic Trail, it retraces about 3000 miles of John Smith’s early explorations along the Chesapeake Bay. “There are still many challenges,” added Ward. She believes that addressing climate change and sea-level rise will be ongoing. And while those topics get the attention of the press, there are so many other areas to attend to, many of which are off the radar of the general public. An example is parking lots and water runoff. Ward noted that building codes require a certain size paved lot for certain sized businesses. That needs to be changed and made more flexible, so we don’t have to pave over any more ground than necessary. In March, 2018, former Governor McAuliffe gave a speech in Hampton during which he noted that Ward was “the greatest Secretary of Natural Resources in the history of the Commonwealth.” McAuliffe noted that his comment sounds superlative, but he assured the audience that what he was saying is true. Today, Ward is back in Hampton, where she serves the citizens as treasurer. She is still involved in multiple environmental projects and serves on the boards of the Chesapeake Conservancy, Virginia Living Museum, and the Virginia Science Museum. Those boards must be delighted to have her, because they will not find another public servant with such real experience. She has served Virginia’s resources and citizens well, from the desk and boardroom to the edge of the marsh.